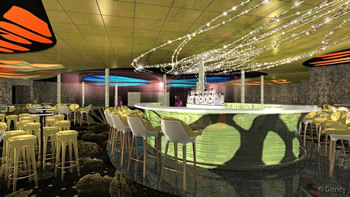 The District is an extraordinary adult-exclusive nighttime entertainment area on the Disney Dream. Featuring sophisticated bars and lounges, this playground for grownups transports adult guests to a world all their own. Guests visiting The District will encounter an array of experiences that stimulate all the senses – with each venue presenting its own unique design, look, feel, sounds and palate-pleasing delights. All venues in The District are interconnected and convey a sense of discovery as guests move throughout the areas. The District is located on Deck 4 aft and is open exclusively to guests age 18 and older. Sophisticated, yet relaxed area featuring live piano music and entertainment. With a cozy modern design, guests will find the District Lounge a perfect place to relax and enjoy live piano music. "Halo" lighting provides a warm atmosphere, reflecting off the domed ceiling and changing in intensity as day turns into night. Warm, welcoming and casual – a modern interpretation of a traditional pub. Families can take part in games and activities here during the day, before it transforms into a sports lounge each evening at 9pm. Guests can sit next to the long curved bar in big comfortable leather chairs and watch live sports and major events on the multiple flat-screen LCD televisions and a huge plasma screen with digital surround sound. Gaming tables and a selection of classic board games are on hand for guests to enjoy. 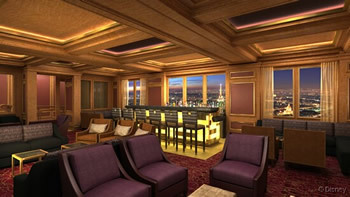 An elegant and upscale cocktail lounge serving champagne and top-shelf libations. Guests here are surrounded by luxurious velvet & marble, with back-lit glass "bubbles" inset into the walls to create an effect of cascading Champagne. The front of the bar is made to look like the wire cage surrounding a Champagne bottle top, the light fittings are reminiscent of Champagne flutes, and even the bar stools look as if they're made from sparkling crystal. 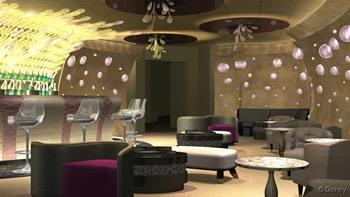 Guests who visit Pink will feel like they've stepped into a bottle of pink Champagne! A chic, metropolitan “sky bar” with ever-changing views of stunning city skylines. Featuring warm wood, lustrous metal finishes and a digital fireplace it feels like a luxury penthouse. Signature cocktails are served each evening, inspired by that day's showcased city. Inspired by the evolution of the butterfly, a dynamic, contemporary night club. Adults will enjoy this modern dance club which plays contemporary hits and classic favorites, and also features karaoke and games. Adults-only entertainment includes themed parties, cabaret shows and comedy acts. A full bar offers a range of beer, wine and cocktails. During the day all ages can visit Evolution for bingo, dance classes and arts and crafts.